A lot of people confuse the terms "fixture" with lamp holder (also called lampholder or even tombstone due to the look of it). 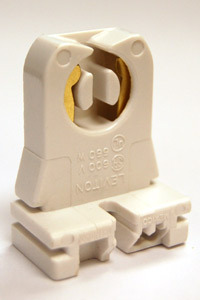 The lamp holder is just that, the part that holds the lamp and has the connectors to deliver power to the lamp. There are different sizes for different lamp types. Both T8 (1" diameter) and T12 (1.5" diameter) use the same size lamp holder. Not all lamp holders are for bipin lamps, although the one shown is.